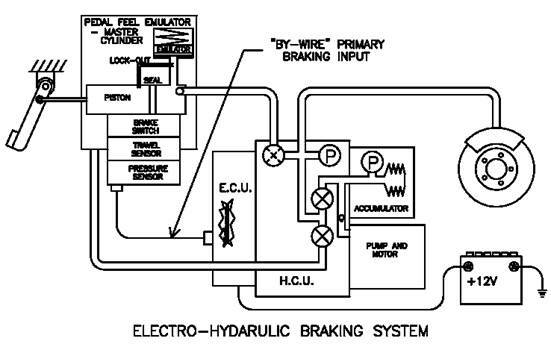 Electro-Hydraulic Brake (EHB) System is a system which senses the driver's will of braking through the pedal simulator and controls the braking pressures to each wheels. The system is also a hydraulic Brake by Wire system.Many of the vehicle sub-systems in today’s modern vehicles are being converted into “by-wire” type systems. 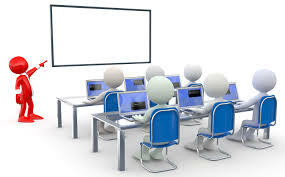 This normally implies a function, which in the past was activated directly through a purely mechanical device, is now implemented through electro-mechanical means by way of signal transfer to and from an Electronic Control Unit. Optionally, the ECU may apply additional “intelligence” based upon input from other sensors outside of the driver’s influence. Electro-Hydraulic Brake is not a true “by-wire” system with the thought process that the physical wires do not extend all the way to the wheel brakes. However, in the true sense of the definition, any EHB vehicle may be braked with an electrical “joystick” completely independent of the traditional brake pedal. It just so happens that hydraulic fluid is used to transmit energy from the actuator to the wheel brakes. A base brake event can be described as a normal or typical stop in which the driver maintains the vehicle in its intended direction at a controlled deceleration level that does not closely approach wheel lock. All other braking events where additional intervention may be necessary, such as wheel brake pressure control to prevent lock-up, application of a wheel brake to transfer torque across an open differential, or application of an induced torque to one or two selected wheels to correct an under- or over steering condition, may be classified as controlled brake performance. Statistics from the field indicate the majority of braking events stem from base brake applications and as such can be classified as the single most important function. From this perspective, it can be of interest to compare modern-day Electro-Hydraulic Brake (EHB) hydraulic systems with a conventional vacuum-boosted brake apply system and note the various design options used to achieve performance and reliability objectives. The conventional system utilizes a largely mechanical link all the way from the brake pedal through the vacuum booster and into the master cylinder piston. Proportional assist is provided by an air valve acting in conjunction with the booster diaphragm to utilize the stored vacuum energy. The piston and seal trap brake fluid and transmit the hydraulic energy to the wheel brake. Compare this to the basic layout of the typical EHB system. First, the driver’s input is normally interpreted by up to three different devices: a brake switch, a travel sensor, and a pressure sensor while an emulator provides the normal pedal “feel”. To prevent unwanted brake applications, two of the three inputs must be detected to initiate base brake pressure. The backup master cylinder is subsequently locked out of the main wheel circuit using isolation solenoid valves, so all wheel brake pressure must come from a high-pressure accumulator source. This stored energy is created by pressurizing brake fluid from the reservoir with an electro-hydraulic pump into a suitable pre-charged vessel. The accumulator pressure is regulated by a separate pressure sensor or other device. The “by-wire” characteristics now come into play as the driver’s braking intent signals are sent to the ECU. Here an algorithm translates the dynamically changing voltage input signals into the corresponding solenoid valve driver output current waveforms. As the apply and release valves open and close, a pressure sensor at each wheel continuously “closes the loop” by feeding back information to the ECU so the next series of current commands can be given to the solenoid valves to assure fast and accurate pressure response. It is obvious the EHB system is significantly more complex in nature. To address this concern, numerous steps have been taken to eliminate the possibility of boost failure due to electronic or mechanical faults. In the ECU design, component redundancy is used throughout. This includes multiple wire feeds, multiple processors and internal circuit isolation for critical valve drivers. The extra components and the resulting software to control them, does add a small level of additional complexity in itself. Thermal robustness must also carefully be designed into the unit, as duty cycles for valves and motors will be higher than in add-on type system. Thus, careful attention must be given to heat sinking, materials, circuit designs, and component selection. Special consideration must be given to the ECU cover heat transfer properties, which could include the addition of cooling fins. On the mechanical side there is redundancy in valves and wheel brake sensors in that the vehicle may still be braked with two or three boosted channels. In regards to the E-H pump and accumulator, backup components are not typically considered practical from a size, mass, and cost viewpoint. However, these few components are extremely robust in nature and thoroughly tested to exceed durability requirements. Similar to the days of early ABS introduction, multiple EHB hydraulic design configurations have emerged. From the mid 80’s through the latter part of the 1990’s numerous ABS configurations ranging from hydraulically boosted open systems, to four valve flow control designs, to modulators based upon ball screws and electric motors came to market before the 8-valve, closed recirculation system became the de facto standard. As with any new technology, there are concerns and tradeoffs to be dealt with. In the case of the electro-hydraulic brake they center around increased electrical and mechanical complexity, failsafe braking performance, accumulator safety, and 2-wheel versus 4-wheel backup modes. Each of these concerns has been answered by prudent designs and incorporation of new component technologies. The configuration adopted in Delphi’s EHB development has included use of four-wheel failsafe with individual isolation pistons and utilization of mechanical pedal feel lockout. This particular design allows system flexibility, inherent accumulator precharge isolation, and the ability to tune for optimum failed system stopping performance for all vehicle classes. Ultimately, no matter which final configuration is selected for a specific vehicle platform, it will have to undergo the rigors of full brake system validation. A carefully de-signed and implemented EHB system holds the promise of enabling the new brake-by-wire features while still reliably performing the everyday task of stopping the vehicle.